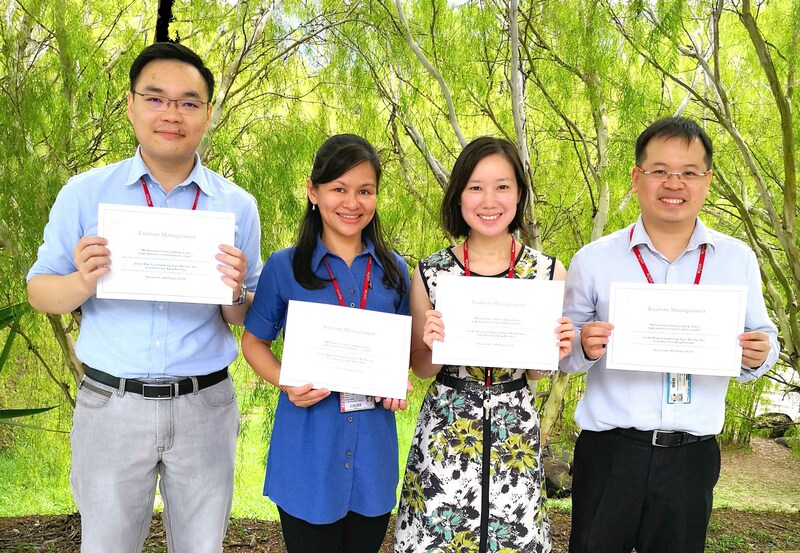 UTAR Faculty of Business and Finance (FBF) academics Hew Jun Jie, Dr Leong Lai Ying, Garry Tan Wei Han and Dr Lee Voon Hsien have marked another breakthrough by successfully publishing their research paper in a high-impact Elsevier journal, namely Tourism Management recently. Tourism Management is the leading international journal for all those concerned with the planning and management of travel and tourism. Tourism Management comprises a multitude of activities which together form one of the world's fastest-growing international sectors. The journal takes an interdisciplinary approach and includes planning and policy aspects of international, national and regional tourism as well as specific management studies. Co-written with Prof Ooi Keng Boon from UCSI University, the paper titled “Mobile social tourism shopping: A dual-stage analysis of a multi-mediation model” received a certificate of publication recognition from the Tourism Management. The research investigates the mobile social tourism (MST) shopping among Malaysian domestic tourists who have visited George Town, a UNESCO World Cultural Heritage Site located in Penang. Tourism Management is a ranked A* journal by the Australian Business Deans Council Journal Rankings List September 2016 (ABDC 2016). In the list, A* ranked journals are the “best or leading journal in its field - publishes outstanding, original and rigorous research that will shape the field. Acceptance rates are typically low and the editorial board is dominated by leading scholars in the field or subfield, including from top institutions in the world. Where relevant to the field or subfield, the journal has the highest impact factors or other indices of high reputation”. Tourism Management is also a Level Four journal in the Association of Business Schools Academic Journal Quality Guide February 2015 (ABS 2015). A Level Four indicates that Tourism Management is a top journal in its field. In the Journal Quality List edited by Professor Anne-Wil Harzing, there are only two other journals in the field of “Tourism” that share the same status as Tourism Management’s. They are Journal of Travel Research (2016 Impact Factor: 4.564) and Annals of Tourism Research (2016 Impact Factor: 3.194). Among these journals, Tourism Management (2016 Impact Factor: 4.707) leads the pack in terms of Impact Factor, which makes it as the most prestigious journal (ranked 1/45 journals) in the research area of “Hospitality, Leisure, Sport & Tourism”, according to the Journal Citation Reports 2016 (JCR 2016) by Clarivate Analysis. Click here to view the certificate of publication.